Trevor was brought up at Selston by his coal mining father Thomas and Selena his very Victorian mother. Trevor says Selston was a great place to live in those days, kids could nip into the colliery canteen for a 2d dinner and it was delicious. Trevor hated school, managed to avoid piano lessons and even got banned from the local church. He did however have a sense of adventure which began with making rope swings on the Dumbles and led on to many camp trips with Alfreton Army Cadets. Trevor was a crack shot and when he was seventeen, was put forward for the Territorial Army. Having a flair for making a bob or two, he enjoyed being paid double wages whilst on TA manoeuvres, being paid by the War Office and also by his employer Bentinck Colliery. From para training to motor cycle side car racing, Trevor has tried it all. No wonder he decided in the late 1980s, after storms had decimated the area, to start a new venture as an aerial erector. You could say Trevor has had his head in the clouds, a time or two, but now with his son running the family business, Trevor has time to embrace another of his favourite past times, cooking and the more garlic and onions the better! 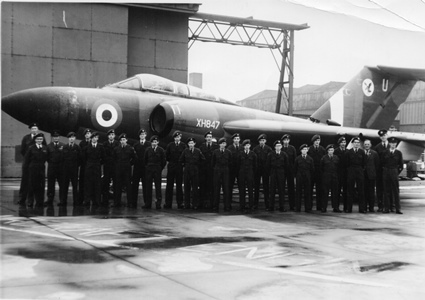 Photo: Ironville RAF Cadets at RAF Binbrook Courtesy John Fox. If anyone has any Army Cadets photos from the period we would be very interested.